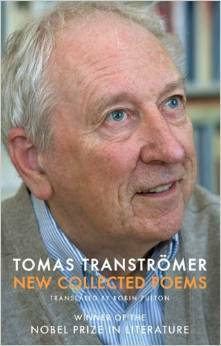 With his death a few weeks ago, I have been re-reading Tomas Transtromer’s work and the first place to go (after the poet’s own website and video) is, of course, Robin Fulton’s comprehensive collection from Bloodaxe. But I have been comparing Fulton’s translations, which seem very faithful if a bit unexciting, to several done by Robin Robertson as published by Enitharmon in 2006. Robertson bills his 14 pieces (presented usefully as a parallel text with the original Swedish) as ‘versions’ or, in the acknowledgements as “imitations”. There seems to me a good deal more vigour and poetic heft to Robertson’s versions, but it’s not immediately clear how many liberties he is taking with the originals and it’s interesting that Fiona Sampson suggests the Swedish writer has been an important influence on Robertson. In what follows I’m looking closely at just one poem from both translators (by the way, I don’t have any Swedish except what a dictionary can give me; nor have I ever made any academic study of Transtromer’s work). ‘The Couple’ first appeared in Transtromer’s collection The Half-Finished Heaven (1962). It’s a distanced study of love (over three quatrains) as a couple turn out the light in a hotel room and, after making love, they sleep. 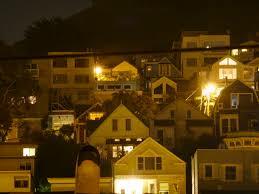 In the third quatrain, darkness and unilluminated houses gather about them as if to watch or bear witness or threaten. Fulton’s opening is very plain and factual: ‘They switch off the light and its white shade / glimmers’. Robertson’s version feels more vivid though it does have a stagey-ness about it, the light becoming the slightly archaic ‘lamplight’ and the plain shade elevated to a ‘globe’. This theatricality is developed in Robertson’s version and is to some degree justified by the final image of the poem where the outer night transmutes to watchers, almost to an audience. But as far as I can tell, this trope is not made much of in the original until that last image. Transtromer develops the fading of the extinguished light in a striking image of it as a dissolving pill or ‘tablet in a glass of darkness’ (Fulton). In the original, the simile is clearly marked and plainly given but Robertson adds a colon and allows the metaphor a good deal more space: ‘an aspirin rising and falling / then dissolving in a glass of darkness’. This is again vivid, visual, though perhaps the dissolving pill image takes over too much from the idea of the fading out of the electric lamp. The original has nothing of this energetic dissolving of the pill with its up and down movement (and does Transtromer’s tablet carry more weight of darkness than Robertson’s headache-curing ‘aspirin’?). The rising and falling image may have come from Transtromer’s next phrase: ‘Then up’ (Fulton). Turning the line ending, this becomes clearly linked with the rising up of the hotel walls (presumably in the couple’s perception, as the light fades and darkness asserts itself). This brief, even curt phrase is isolated between full stops and Fulton follows this and seems to be responding to the signals of the original in terms of the couple’s alienated, isolated experience, with language itself fragmenting to reflect that. Robertson differs again, lengthening and making more elegant the end to quatrain 1. He also introduces another theatrical reference not present in Transtromer’s original: ‘Around them, / the hotel walls slide like a back-drop up into the night sky’. Against Transtromer/Fulton’s jagged, uncomfortable process, Robertson’s walls rise more smoothly, the logic of his image suggesting they more fully establish a scene, rather than imprison. Again Robertson’s version is visually more pleasurable but on second or third thought, how many back-drops have you seen rise from the floor, going upwards? Quatrain 2 opens apparently after the couple have made love. Fulton again seems to follow the plainness of the original with ‘The movements of love have settled’. ‘Subsided’ might have been a better word but it’s hard to judge whether the strangeness of this is in the translation or the original which does seem to want to describe the couple’s intimacy from a frightening distance. Robertson’s theatrical imagery recurs with ‘Love’s drama has died down’ which also distances the intimacy, though in a different way, gesturing towards the hollowness of romantic cliché rather than Fulton’s ‘movements’ which suggests a more completely meaningless activity. There’s not a lot to choose between the two versions in the remainder of quatrain 2 as the couple’s ‘dreams’ (Robertson) or ‘most secret thoughts’ (Fulton – this is pretty literal) are said to meet (Transtromer repeats the word ‘meets’ here) like colours blurring in a child’s painting. For Robertson, the colours ‘meet and bleed’ whereas for Fulton they ‘meet and flow’. ‘Bleed’ is a powerful word choice of Robertson’s here but again I wonder how right it is as the evocation of a wound in this middle quatrain where (if anywhere in this tough little poem) there seems to be some suggestion of communion, some sort of meeting of human lives. tonight. With quenched windows. The houses have approached. extinguishing its windows. The houses have approached. Robertson’s vivid animation of the city-scape is more thorough and convincing at this point and, in the poem, that is important. a crowd whose faces have no expressions. this audience of cancelled faces. This is wonderfully economical, with a good play of vowel and consonant music, although ‘attentive’ is more neutral than waiting or anticipatory. Both ‘audience’ and ‘cancelled faces’ are dramatic choices. In one sense they complete the decision Robertson makes to bring the theatrical imagery far higher in the mix than in Transtromer’s original; the couple’s lives are performances though the only audience they have is the featureless and expressionless city about them. But ‘cancelled’ is also a surely over-dramatic in suggesting the faces have suffered (see ‘bleed earlier’) some mysterious trauma whereas in Fulton (and I think in Transtromer) the waiting a faces are merely empty, indeed, perhaps waiting to be filled. Transtromer’s poem has a poignancy derived from the fact that the couple’s love-making, though distanced and close to meaningless in the great scheme of things, is perhaps the only possible source of meaning/expression in a largely unresponsive world. Robertson’s version manages to turn the dramatic volume several notches but in doing so pushes out to the extremes. 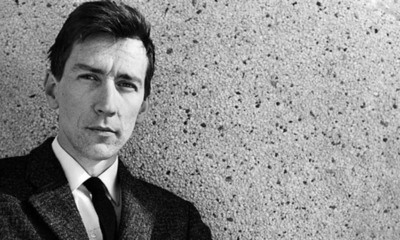 His poem suggests an even bleaker diagnosis in which human activity is nothing but theatricality, stage sets, drama, while any potential audience or act of witness that might be possible involves only those whose faces and identities have already been wiped. The Verdict: actually I set out preferring Robertson’s version because it garnered a more immediate response from me with its obvious sense of drama. On reflection – and looking more closely (as far as I’m able) at the original Swedish – I think Fulton is closer to the source (and therefore his poem reads more strangely, less easily, than Robertson’s). It’s this kind of frustratingly equivocal conclusion that makes those who fancy themselves as translators think it’s worth having yet another go at bringing a poem across into English. Just to throw a curved ball in right here at the end, here is Robert Bly’s translation of the same poem . . . declare your preference!! in a glass of darkness. Then arising. The hotel walls shoot up into heaven’s darkness. on the wet paper in a schoolboy’s painting. tonight. With its windows turned off. Houses have come. a mob of people with blank faces.